Last week my wife and I went on a trip to the Dominican Republic compliments of NBC's The Marriage Ref. All of the guests on the show were given an all inclusive trip and the timing for our trip couldn't have been better. 86 degrees, white sand beach and perfect water. 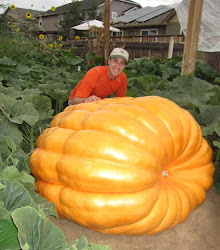 If you have been following this pumpkin blog you know that my wife and I were on the Marriage Ref discussing giant pumpkin growing and the dispute was over whether or not I spend to much time in the pumpkin patch. Celebrities Jerry Seinfeld, Ricky Gervais and Julianne Moore all sided with me on the show and I went on to the final round where I took second place (might as well as been last) in a chance to win $25,000. If you are looking for a quite vacation spot, Punta Cana in the Dominican would be a great choice. Both Amber and I aren't resort people but the Bavaro Palace Resort that we stayed at was very modern with lots to do. A very enjoyable time for the both of us. So thanks to Tom Popovich, Jerry Seinfeld, NBC and all of the crew for a great time!